Here's the newest items at Shabby Cottage Shops! There's a great sale going on for Mother's Day, you'll find the perfect gift to Celebrate Mom. We also have several new members who are having grandopening specials, like 25% OFF and other great discounts for Mother's Day. Make sure to stop by and visit all of our wonderful boutiques during this fabulous sale! I am off to Virginia to spend the weekend with my mom, she is doing better, but still a long way to go. I am just thankful she is still here and remembers me. Cherish every moment with your both of parents, they are God's greatest gift to us! Oh, where have I been??.. Alzheimer's Dementia..Awful Diseases!! Sorry I haven't posted in a while! I am still trying very hard to get my mother settled in and it's been a very hard time trying to do so! She is doing okay, but having a lot of issues with medications and trying so hard to adjust to living in "assisted living". My mother has always been such a trooper and a fabulous woman, not to mention the best mom and it just breaks my heart to see her this way. I have been visiting her every weekend and watching her go downhill and it's so hard to see someone, especially your mother, just have everything taken away and even remember if she talked with me on that day! Things with Mimi's Rose have sort of taken a back seat and I apologize for this, but as I am sure everyone will agree...first things first. I want to share a few things with all of you and hopefully make everyone aware of how important it is to ensure you have POA (Power of Attorney) if your father has passed or your mother! You are NOT able to do anything without this, thanks to the stinky HIPA laws, because you don't even have any rights to help them if you don't! Imagine that, your mother gave birth to you and you don't have any rights, unless you have the so many necessary papers to say you are even their child!! How can that be? I had to do many things to ensure my mother is well taken care, happy and provided for during the rest of her life. So talk with your parent(s), watch them and make sure you see the signs of Alzheimer's or Dementia, don't ignore them and simply think they are just having a "senior moment" as many of us refer to them as! You can read all about Alzheimer's or Dementia and the symptoms here and also on the web, they have a wealth of great information available including what the symptoms of these awful diseases are and no, they are just not "senile", it's truly much worst than that! Also, don't ever think it can't or won't affect you or your family, or your mom, dad or anyone close to you, because it does! Maybe it's just something we don't want to think about and I didn't, but it happens, so plan and prepare for everything with respect to Alzheimer's and Dementia. There are many many organizations who will help you cope with watching your parents slip away and believe me, it's one of the hardiest things I have ever had to deal with in my life. If your parent don't have long term health insurance, now is the time to really look at this because the cost of assisted living is astronomical, not to mention the cost of the medications they will need. Medicare does not pay for assisted living in the private sector, so don't count on that and quite honestly, you wouldn't want Medicare to help pay for this, because it's not assisted living, but a nursing home, which is run by the state and we all know what that can mean. So plan now for yourself and everyone you care about and love, because trying to deal with these terrible diseases and then coping with everything else is very stressful. Long term care is a fabulous option, though my mother didn't have it, she was a very smart lady and made sure she had enough money for any emergency, for which I am very thankful. The cost for this type of monthly care is huge, again, not to mention the cost of medications and everything else you have to do to make sure your parents are safe and hopefully happy, in their new surroundings! The place my mom is at is absolutely wonderful! She has a cat named "Gus" and has had him for nine years, which I think he has been her saving grace! I visited many assisted living facilities and when I walked into this one, (which is not a large one), there sat "Lilly"! She is the resident welsh corgy dog and she greeted me with such warm eyes and a friendly wagging tail. Well that set the tone for me! I, of course, walked in, "unannounced", which is what they recommend you do, so you can actually see what is happening and observe the sites, sounds and smell of the facility. They were very kind, helpful and gave me a tour of their facility mom now calls "home". They also have what's called a "memory care" side, which thank goodness mom doesn't have to reside on this part of the facility. They gave me a tour of the rooms with private baths, with shared baths and even have room where two people can share if they like! It has a fabulous dining room, a very large outdoor fenced in backyard where they can even have a garden if they so choose. A lovely front porch area with wicker furniture and they can even have their own bird feeders at their window! Well, one of the most important factors to me was that mom be able to keep Gus, her cat! We chatted about everything and then I asked, "can Mom have her cat here"! They said "YES"!! I was just so relieved because I was so concerned I would not be able to find this level of quality care I wanted mom to have and also have her cat too! I was shocked, but then Lilly (the resident dog) helped me make up my mind. So I left, revisited again and signed the necessary papers. This facility was kind enough to let me sign all these papers without any POA or other necessary papers required by law, which was amazing to me, but I was so thankful they worked with me, as some of the other facilities wouldn't even talk with me. This facility has just 45 rooms, is owned by a fabulous corporation which does really seem to care about all of their residents and I think it shows!! You can expect to spend at LEAST $3500 A MONTH, just for living in an assisted living facility, if it costs any less, better check your state and found out about them, because they make many infractions against! I checked every facilities record even before I started visiting the ones which would fit mom and which I felt would appeal not only to me, but mom most of all!! So be sure to check each facilities records, they will list what types of violations, etc., they have been given, because if they are registered with the state, the state visits these facilities on a regular basis. Make sure you know everything there is to know about any of the ones you may be interested in, because appearances can be deceiving, even if they look great, it truly doesn't mean a thing if they have a number of violations. If they aren't registered with the state you reside in, don't even consider this type of facility, because then they don't have to follow the state guidelines! I finally have gotten all the papers I need to make sure mom is well taken care and most of all happy for the remainder of her life and it's truly a relief to know I can now take care of my mom, giving back to her for what she gave me during my life and for that I am so thankful. I just wanted to get some things off my chest, thanks for taking the time to let me share this experience with you and please ensure you help your parents take care of things, because without them we wouldn't be here today! Hope everyone has a beautiful Easter and thank God for our wondrous world and our family! Are you Ready for Easter?? We're having a great ONE DAY SALE for Thursday's Marketplace! 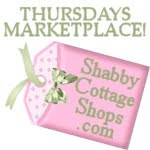 It's Thursday's Marketplace at Shabby Cottage Shops! You'll find "Some of Our Favorite Things" at a very special price, today only! I am having a great sale, I just added new Vintage Chenille Childrens, infants and toddler jacket/swing coats and fabulous 2 piece outfits to my site!! The great news is that all the new boutique custom Vintage Chenille clothing is 20% OFF for my Thursday's Marketplace at Shabby Cottage Shops. Scroll down to the end of the post and you will see just a sampling of my newest creations. I will be adding more today, so make sure to stop by and get your Easter coat or outfit at a great price! My designs do "Start Conversations and Get People Talking"!! Visit each one of the participating shops by clicking on their shop name for fabulous "ONE DAY SPECIALS"! 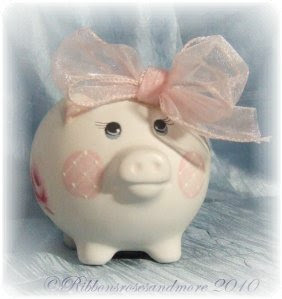 This "Little Piggy" went to Thursday's Marketplace at Ribbons Roses and More! You'll find this wonderful new Cupcake Cake Stand at Sweetheart's Nest and more fabulous accessories during Thursday's Marketplace! Vintage Bottled with Rhinestones is just one of the many treasures you'll find at French Charmed's Thursday's Marketplace. Visit Mimi's Rose Chenille Boutique, they've added a lot of new items, including some gorgeous Vintage Chenille Children's Jackets and other clothing fit for a princess! She has placed them on sale for Thursday's Marketplace, 20% OFF for today ONLY! Visit Debi Coules ~ 15% OFF Your entire Purchase, use the code "Roses" when you check out! Make sure to stop by every week, our shops will always have something special on sale for Thursday's Marketplace at Shabby Cottage Shops! Thanks for stopping by and hope you enjoy my ONE DAY SPECIAL! 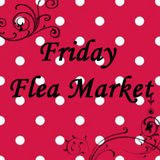 Stop by Thursday's Marketplace at Shabby Cottage Shops!! Come shop with us during our first weekly shopping event "Thursday's Marketplace" at Shabby Cottage Shops! The members below have chosen to have a fantastic ONE DAY SALE, every week on Thursdays! You'll find unbelievable buys, free items with purchase and even a free doll dress to match your little one's dress! There are "unannounced specials" and fabulous products from the participating shops below for this week's "Thursday's Marketplace"! Just Click on the banner and find some great sales for ONE DAY ONLY!! Visit Vintage to Vogue Shop! Visit Ribbons Roses and More! Visit Prim and Sassy Cottage! Visit our Newest Member ~ Another Bella Boutique! Make sure to stop back by every Thursday, for "Thursday's Marketplace" at Shabby Cottage Shops, you don't want to miss all the fabulous one day specials! Don't forget to enter our "Sweet Treats" Valentine's Day giveaway, it ends in two days and the lucky winner will be announced on February 1st!! You don't want to miss this fabulous "Ring Out The Old Sale"! You'll find many wonderful products on sale at Shabby Cottage Shops! You can view the current newsletter from Shabby Cottage Shops by clicking here or looking to the right sidebar for "Recent/Newest Newsletters", just click there if you like. There is where to find the scoop on what's happening right now at Shabby Cottage Shops!! If you aren't on their mailing list, you're missing a lot of great info on special sales, new items and what's happening over there, so be sure to sign up for "Get The Cottage News" here!! They won't spam, sell or share your information with anyone and truly respect your privacy! Oh gosh, almost forgot, don't forget about the great "Sweet Treats" Valentine's Day Giveaway, they're having in their blog! These are some of the sweetest treats you ever have a chance to win. So stop by and enter today, it ends on January 30, so there's still a bit of time. The winner will be announced on February 1, just in time for you to receive all the "Sweet Treats" for Valentine's Day! "Sweet Treats" Valentine's Day Giveaway at Shabby Cottage Shops! 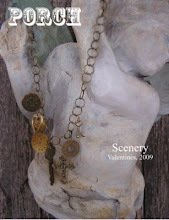 Here are the "Sweet Treats" you'll find at Shabby Cottage Shops Valentine's Day Blog Giveaway! Everything pictured is included in their giveaway! Stop by today and enter for a chance to win the "sweetest treats" Valentine's Day! It ends on January 30, just in time to celebrate love and romance with your sweetheart! A Fabulous Giveaway and a Huge Sale!! AT SHABBY COTTAGE SHOPS BLOGSPOT! IT'S VALUED AT $350.00!! HURRY IT ENDS ON JANUARY 30, 2010!! STOP BY SHABBY COTTAGE SHOPS! ENTER THIS FABULOUS VALENTINE'S DAY GIVEAWAY HERE OR ON THE RIGHT! Read more about it below!! It's time for our giveaway to start!! We invite you to join us and participate in our "Sweet Treats" Valentine's Day Giveaway! There is no purchase necessary and it's just in time to "Celebrate Love and Romance" with a very special gift for your sweetheart from Shabby Cottage Shops! The "Sweet Treats" giveaway will end January 30th, at 12 Midnight, EST. The lucky winner will be announced on February 1st at noon EST. So make sure to check back then! WE'RE HAVING A "RING OUT THE OLD" SALE TOO! All of my Christmas Fabrics are 40% OFF to celebrate the New Year, until January 22nd! Make sure to stroll over to Shabby Cottage Shops for huge savings!! You'll find The Perfect Gift here! Stop by every Thursday for fabulous ONE DAY SPECIALS! Read the Latest Newsletter from Shabby Cottage Shops Here! Help DeafHope in the Chase Community Giveaway! OPEN THE DOOR to a Safe Deaf Space where Deaf women and their children lead new lives free of abuse. PLEASE VOTE!! "Sweet Treats" Valentine's Day Giveaway! It's started!! Ends Jan 30th!! Enter the "Sweet Treats" Giveaway at Shabby Cottage Shops! It's valued at $350.00! A New Online Boutique Shopping Mall! 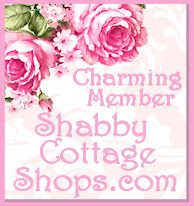 Join me as a Member of Shabby Cottage Shops, a great new online boutique shopping website! Join Me at The Shabby Cottage Shops Ning! Enter to Win the "Pink Holiday Magic" Shopping Spree! Hurry, contest ends November 25th at Midnight No purchase necessary!! Blog Giveaway at Shabby Cottage Shops! These wonderful thread artists have joined me In Supporting Our Troops On March 21, 2009! Want to show Your Support? Sign Up for Mimi's Rose Newsletter! Receive 15% OFF Your First Purchase! Sign up Now for Email Updates On Great Sales, Events & Special Discounts for Members Only! Entire Blog is Copyright Protected! Love my texts or pics, don't copy without Permission! Thanks!! It will be costly! Find My Blog listed at the Big Blog Collection! Follow me ~ I'm a Networked Blog! Visit this Wonderful Blog ~ Just one of My Favorites! Beautiful Blogs You Don't Want to Miss! ~Rose Cottage Candy Shoppe~ Fudge for Christmas Gifts! It's rainin fans! HALLELUJAH! It's rainin fans! Want Special Discounts?? Sign Up for My Newsletter! Join us for our First "RING OUT THE OLD SALE"! Sale starts January 8 ~ January 22! HUGE SAVINGS EVENT AT SHABBY COTTAGE SHOPS! PLEASE JOIN ME IN THIS SPECIAL TRIBUTE TO OUR AMERICAN SOLDIERS! Crafty Mom Blog, Visit this Blog for Crafts & Swaps! Take a Break, Share Your Blog, your Mom stories and share the fun! Great Tips for Working Moms! You have got to click on this one ~ there are 1,000's of great giveaways! You'll! find my "giveaways" there too! Great Blog Giveway Spots & Other Great Happenings in the Blog World! I'm a member of Vintage Village ~ Vintage Treasures for Everyone! Visit my Page on Marmalade Pink! I am so excited to be Featured in Porch Magazine, along with some other wonderful ladies! Show and Tell Friday ~ Mimi's Rose Treasured Pretties for Show and Tell Friday! 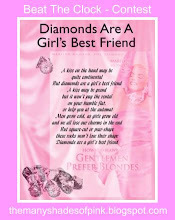 Pink Diamonds are a Girl's Best Friend! Visit Victoria Rose Graphics for the Prettiest Graphics and Website Design Anywhere! Check out this site, they have gorgeous glitter graphics you can add to your blog! So ~ Who Is Mimi? I am retired and enjoy designing and creating clothing for infants, toddlers, children and adults from Vintage Chenille. I started creating custom boutique clothing for my granddaughter, Lauren, "My little rose" 5 years ago and everyone inquired as to where I got her outfits, so this was the beginning of "Mimi's Rose Chenille Boutique"! Lauren is my "little rose" and she calls me Mimi, thus the name "Mimi's Rose Chenille Boutique". I live in Eastern North Carolina on the coast with my wonderful husband and new addition to our family, "Cody", a cute little spunky cocker spaniel! Visit my website by clicking on the banner at the top of the page, for great boutique clothing, Vintage Chenille Yummy Confections ~ Cakes, Cupcakes and Teacakes, Romantic Eye Candy Light String Confections. gorgeous fabrics and more. There is always something on sale at Mimi's Rose Chenille Boutique. While you are there sign up for my newsletter! Current copyright laws allow for all work to be automatically protected when it is created. All artwork, photos of my work, text, logo, descriptions, and derivative works from Mimi's Rose Chenille Boutique are not to be copied or imitated in any way without my permission. All rights reserved solely by Mimi's Rose Chenille Boutique.